Sadly, this product has now sold out. Why not try some of our other Christmas meat instead? Whole, plump organic chicken for roasting or poaching. 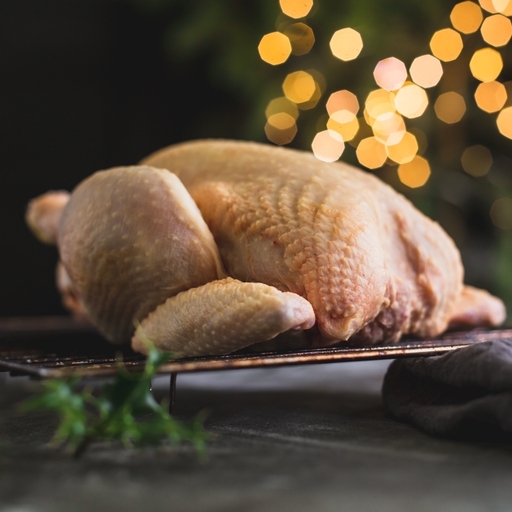 Our British birds are truly free range and organic; they spend their time grazing outdoors, for rich, tender meat that’s full of natural flavour. We include the giblets too, so you can make the absolute best proper gravy. Roast dinner heaven! Serves 5 generously with plenty of leftovers (300g of cooked meat per serving). For a 2.5kg chicken, brush with olive oil or butter, season well inside and out, and roast in a 190°C/Gas 5 oven for about 110 mins, until no pink juices remain (any stuffing will increase the cooking time). Baste several times during cooking. Alternatively, poach with stock vegetables for 110 mins. Keep in fridge and use by the date on the label. This can be frozen on the day of delivery to retain its flavour and tenderness for up to 6 months. Once frozen defrost thoroughly and eat within 24 hours. Do not refreeze once thawed. Chickens are naturally timid creatures, and without encouragement, stay indoors and never learn to roam and scratch. Many birds labelled ‘free range’ are kept in houses of many thousands. In theory they have the option to go out, but very few actually do. By contrast, Andy’s organic birds live in small flock sizes. They have shelters to encourage them away from the house, which Andy moves regularly to encourage them to roam about.